Architecture creates expectations, and it can start communicating something about a business at first glance. You could be illiterate and still know what El Torito serves because of the hacienda look, and the same is true of places like Izakaya in Manhattan Beach, Captain Kidd’s, or any Denny’s in the world. That instant recognition of a culture or cuisine can be a problem when the next owner wants to take things in a different direction. 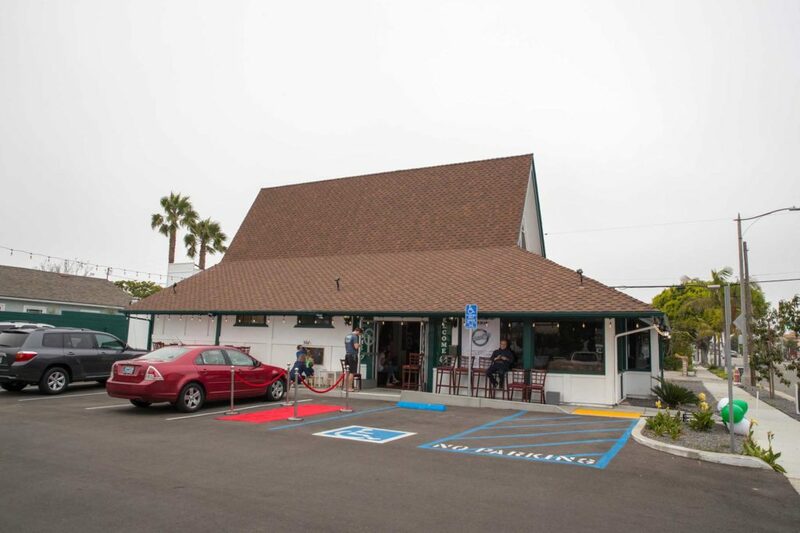 Consider the situation of the new Redondo Mama D’s, which moved into a building with an extremely tall peaked roof. The place was designed to mimic traditional Thai architecture for the previous tenant, and the Southeast Asian style might seem to be difficult to erase without tearing it down. Instead a creative remodel has given it the feel of a trattoria in the Italian Alps that happens to be in a ski chalet. Whoever came up with the idea and executed it was brilliant, because you’d never know it had been anything else. There’s another cue about what they serve here that doesn’t require reading: when my sister-in-law got out of her car in the parking lot, she immediately commented on the smell of baking bread and garlic. 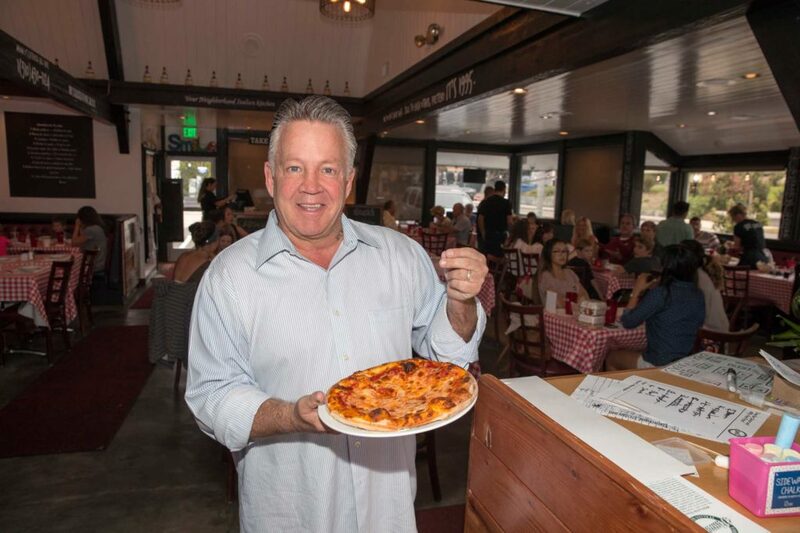 Since their garlic bread and garlic knots are signatures of the original Mama D’s in Manhattan Beach, it’s obvious they’re following the same recipes. Sure enough, as soon as we were seated a basket of bread, hot from the oven, arrived, along with a bowl of herbed olive oil for dipping. It’s sufficiently addictive that we all kept nibbling at it despite wanting to try appetizers. Since we knew that the portions here are generous we had to be careful not to over-order. Nonetheless, in two visits we tried two starters and two salads. The calamari was a large portion that was fried soft rather than crisp so it remained tender. It’s decent but not essential. I’d recommend the deep fried ravioli instead. The crispy cheese-stuffed dough packets on a bed of marinara sauce hit the spot. You’ll see that marinara sauce a lot here, as it’s in about a third of the items. When you lean on a sauce that much it has to be good, and this one is packed with fruity tomato and herb flavors that make it light and versatile. It worked with both the calamari and raviolis, and made another appearance aboard a plate of chicken parmesan. Before that, though, we wanted some salads to get our minimum daily requirement of green stuff. The Caesar was decent but had little or no anchovy flavor in the dressing, and since I like the extra umami and sharpness it’s good but not my style. I much preferred a house special salad that included almonds, raisins, red onion, and parmesan cheese with a honey vinaigrette. This is usually made with kale but on the night we ordered it they substituted spinach, and it was so successful that I’d suggest that they make that a regular option. There was a slight hint of Middle Eastern flavor here, not surprising since Arabs brought many ideas to Southern Italy during hundreds of years of trade and conquest. This salad was a tasty reminder of historic cultural fusions, and one I’d happily order again. From the long list of entrees, I have tried a pizza with sausage and eggplant, seafood lasagna, filet of sole with vegetables and pasta, spaghetti and meatballs, and a daily special of short rib ravioli in sage butter. That short rib ravioli was something they might consider keeping on the menu, as it was an interesting departure from the other flavors. The meat had been seasoned and stewed down to concentrate the flavors. If your usual order is a steak with pasta this was the same flavor balance, but with the meat inside instead of alongside. The pizza was obviously made with fresh dough and had a medium crust that was soft rather than crisp. That marinara sauce made another appearance along with the mushrooms, fried eggplant, and the rather spicy Italian sausage we requested. It was a challenge to eat neatly. I tend to prefer thinner crusts and thicker sauces, but my wife, who transplanted from the East Coast, said this was more like the pizza she grew up with. The filet of sole here is tossed with your choice of pasta along with chopped tomato, mushrooms, and artichoke in herb butter. Like almost all the cooking here, its virtues are simple, fresh flavors. The one item that really surprised us was the seafood lasagna, which is baked in a thick pink tomato-cream sauce. This was remarkably good and quite subtle, a departure from the full flavors elsewhere in the meal. It probably should be served with a spoon because you’re not going to get all of that sauce with your fork, and you’ll want to. Mama D’s has a slightly eccentric wine list at very fair prices – a Ruffino Chianti was $9 a glass but on one visit was the featured house red at $20 for a whole bottle. You can also order two glasses of wine or beer and get the third for one cent, which makes everything on the list a good deal if you like drinking three glasses over the course of dinner. A few desserts are offered but the meals were so substantial that we didn’t have room for them. We did enjoy the complimentary chocolate chip cookies, a dash of American tradition to finish a Sicilian meal. In an area with many high-end Italian restaurants Mama D’s is a bit different, a family-friendly place to get lots of good food at a modest price. The atmosphere is casual and a bit boisterous, the service friendly, and they’ve settled in astonishingly quickly. It’s a remarkable success in a location that many, including me, thought would always be identified with the other side of the world. Mama D’s is at 1109 South PCH in Redondo. Mon. — Fri. 5 p.m. – 9 p.m., Sat. 4 p.m. – 9 p.m., Sun. 4 p.m. – 8:30 p.m. Parking lot, wheelchair access good. Children’s menu, beer and wine served, corkage $15. Partial menu at mamadsredondo.com. (310) 316-5050.